Our pedal kits do not include battery snaps. We do this because we feel batteries are pretty much obsolete, expensive, and bad for the environment. We recommend using a wall-powered power supply such as a Boss-style 9V DC adapter, or a pedal board power supply. Additionally, our kits, by default, come with 2 mono audio jacks. 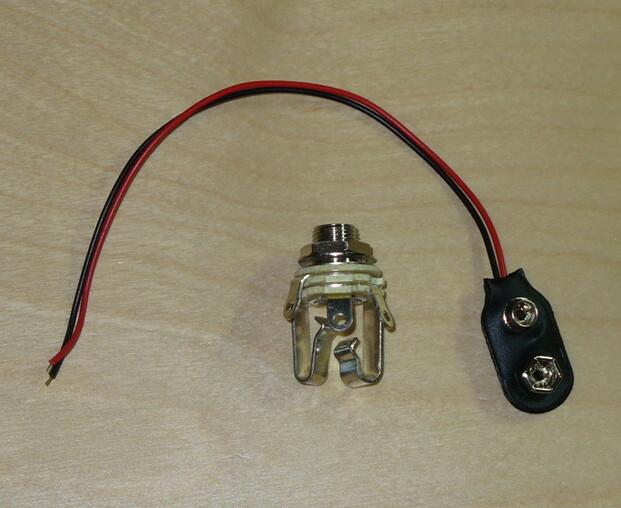 In pedals which accept batteries, a stereo input jack is typically used as a switch to prevent the battery from discharging when no audio input cable is plugged in. If you have questions about this, we recommend you read the Crash Course for new pedal builders from the GuitarPCB.com website. For $1, you can upgrade your kit contents to substitute one of the mono jacks for a stereo jack, and you will get a battery snap for a 9V battery. Snap style may vary from picture. Please Note: We use high-quality Neutrik jacks. Builds that require a bias adjustment are not recommended for use with a battery, such as the Stage 3 booster, the Angry Camel, etc. All of the pre-drilled enclosures that come with a pedal kit leave room for a battery unless otherwise noted on the kit's page. An actual 9V battery is not included in this item. This item is sold with a kit purchase only.